On the day of your wedding, the last thing that you want to have to worry about is the food that will be served; how good it will be, whether or not there will be enough for everyone, that the centerpieces and table arrangements are nicely presented, etc. A good caterer or mobile chef service will be able to take that stress off your hands, leaving a big effect on the pace and atmosphere of the wedding reception. 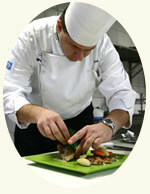 Does your caterer or mobile chef service have a catering license, liquor license and liability insurance? 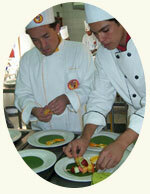 A caterer with a license and insurance must register with the state and comply with all health codes. Does your caterer or chef have references? Past customers can tell you about the caterer’s food, personality, professional skills and his or her ability to handle the unexpected. Can you taste some of your caterer’s food? Good caterers will let you sample foods to help you decide on your menu, and see photos of food they’ve served at previous wedding receptions to check presentation. Can your caterer provide the cake? You can cut down on the number of vendors you have to deal with by getting the wedding cake from your caterer, but if you’re looking for something unique, work with an independent baker who specializes in wedding cakes. Who provides tables, dinnerware, flatware, glasses, tablecloths? Some caterers provide everything. Some do not. The reception venue can often supply what the caterer cannot. Can your caterer help with the decorations? Make a checklist of decoration items and ask your caterer if s/he can handle them while setting up. How many service people will be on hand? Check to see how many servers, busers and bartenders will be provided, then make sure the same number show up. Who will be in charge while the meal is served? Your caterer should be present, but if he or she can’t be there, get the name of the person who will be in charge, and work with this person during the planning stages so that you’ll have a good working relationship established when the big day arrives. What are the hidden costs, such as cake cutting, overtime, tax and tip? Discuss all unexpected costs with the caterer in advance so you aren’t surprised when you get the final bill. Find out how big of a deposit the caterer needs and when the balance will be due. What happens if you cancel? Is there a refund policy if something goes wrong that is the caterer’s fault? Work out financial details well in advance to avoid overspending.